Finding a free WiFi network while on vacation can be a nightmare. Using advanced GPS technology, WiFinder scans and places all networks on a map. While walking or driving, WiFinder will automatically update the location of networks if it finds a position that will provide a better signal. Open networks are clearly marked with a green dot, and closed networks with a red dot. Simply throw the laptop on the passenger seat before leaving the house for the day, and after a day of driving, have a comprehensive map of open networks! Even automatically join the best network in range. In modern households, its common for families to have a WiFi router. In apartment buildings and dense city areas, hundreds of WiFi signals can often be picked up from a single spot. WiFinder can provide insight to optimizing your home network and reducing interference from other signals. The calmest, or even unused, WiFi channels are presented with every scan. • Save logs of WiFi scans for future use when travelling back to a different city. Even share these logs with others. • Graph network signal strength over a period of time to help identify if other devices cause interference when turned on. • From viewing advanced router info to identifying unused channels; System Administrators easily determine the best router configuration for an environment. Not all Macs are created equal! Not every Mac comes with the RAM required to open and run a dozen memory-hungry Mac apps. Not everyone can afford the latest and greatest Mac that's loaded with lots of RAM. If your Mac is older, or short on RAM, SixtyFour can help you reduce memory usage. That means you can keep your Mac running longer, but running better. If you intend to run more apps at the same time, and, at the same time, maintain system performance, but can't upgrade to the newer, faster Macs with more RAM, this is the app for you! An app usually contains several versions of the code: a version intended to run on 32-bit processors and another one meant for the more recent 64-bit processors. This is necessary to ensure that the app will run on all Macs that support Mac OS X. Forcing a 64-bit app to open in 32-bit mode reduces its memory usage significantly. Opening a 64-bit app in 32-bit mode, reduces its memory usage by at least 10% and commonly as much as 50%. SixtyFour presents a list of 64-bit apps that can open in 32-bit mode. A selected check box indicates that the app will open in 32-bit mode and a non-selected check box indicates that the app will open in 64-bit mode. 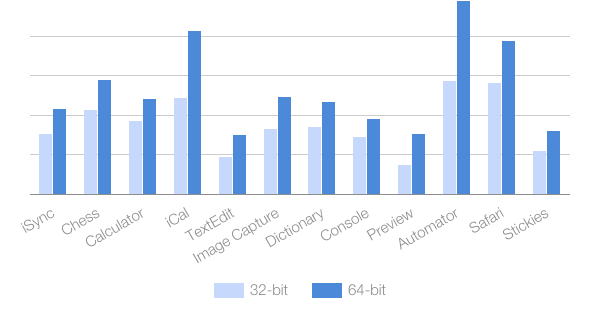 Check those 64-bit apps you want to run in 32-bit mode, and you're good to go. Changes made in SixtyFour will be kept across reboots. It is not required to keep SixtyFour running. That's it! SixtyFour includes a Quick Look plug-in which extends Quick Look’s standard functionality to display extra info: app architectures, app platform info and bundle version. SixtyFour Agent is an app contained within SixtyFour, which takes over the functionality that was previously available in SixtyFour, displaying the bit mode of an app when launched. ProcessTimer can be launched from the application menu, performance tools. It can help you determine whether or not to run an app in 32-bit mode.